Lovely Way To Get Through Wednesday! Is it me or is this week just dragging along at the slowest pace ever? 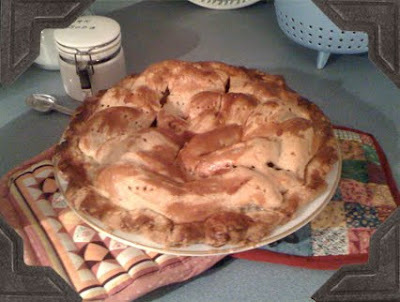 In an effort to boost spirits on this very long day, I'm sharing a picture of my grandmother's amazing sugar-free, all-natural apple pie! This pie was made in honor of Eric's father coming to visit next week and let me tell you, this picture doesn't do it justice. Hope your day is going a little faster than mine is! Anyone else have any lovely pictures to share? !